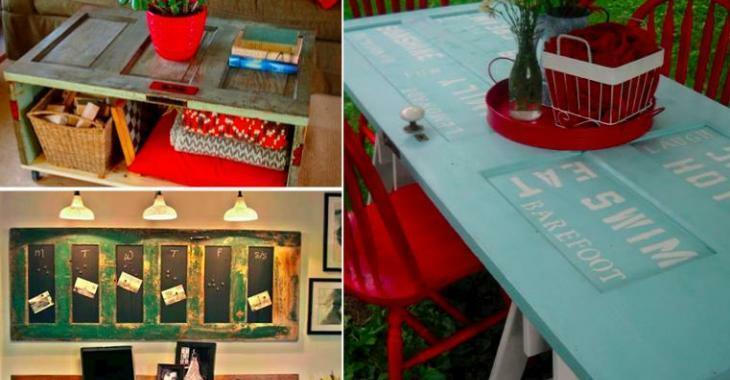 Decoration : Recycle your old doors: 12 pretty ideas to give them a second life. Recycle your old doors: 12 pretty ideas to give them a second life. 12 ideas to inspire you! Do you like to create things ? Give a second life to things, furniture? Have original furniture? Then the following pictures will certainly inspire you to transform your old doors. Sometimes we keep doors of all kinds in our basement, in the garage thinking that we will reuse them but this is rarely the case; the doors rot and take space in your house. Why not give them a second life? Don't you think this garden bench is beautiful? It was built with an old door! I agree that you should have some carpenter skills to cut the door and assemble everything, but the idea is very good! This old door has been turned into a bulletin board! It adds a certain character to this room! Photos will be beautiful like this! This shelf was made with an old door! I would see this kind of decoration in a garden, don't you think ? This idea is really simple to realize ! Two wooden trestles, a door painted with a color you like; a superb picnic table ! This TV stand was made with a door ! It's really cool to be able to build a unique piece of furniture like this one ! I like this coffee table with its rustic look ! To bring a nice rustic touch to your decor ! I would see this kind of decoration in a corridor or even a big entrance ! Do you like this kind of project ? This bar is fantastic, with a rustic look ! It's made with an old door ! I think this idea is my favorite ! The door has been combined with a nice bench with a small storage drawer and a coat rack. If you like having original furniture; recycling old doors is a very good idea ! Do you have a favorite transformation ? I must admit that the last idea is really my favorite ! Feel free to leave me your impressions !